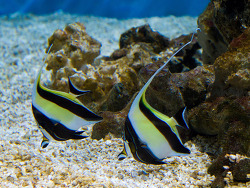 The Moorish Idol is the ONLY member of the family „ Zanclidae“, often misidentified as a Pennant or Bannerfish, which are actually species of the Heniochus genus that are commonly referred to as the "False" or "Poor Man's" Moorish Idol. They have a very long, white, sickle-shaped dorsal fin, two broad black bars on the body, and a yellow saddle across the snout. There is a small, bony projection in front of both eyes of adults. One of the most widespread fish, it can be found throughout the Pacific Ocean from Hawai'i to Australia, and from the west coast of Central America westward to the coast of Africa and the Red Sea. The average size of the Moorish Idols in the wild reaches about 18 cm, adults may attain 20 – 24cm. Most seen in the wild as a single individual, but often forms pairs and occasionally larger schools. Moorish Idols are moderately-peaceful fishes best kept with other non-aggressive fishes. They are typically difficult to keep, most adult Moorish Idols usually do not adjust well to aquarium life. Smaller juvenile or sub-adult Moorish Idols may more readily adapt to their surroundings, but they are in generally unpredictable in their feeding behavior. It is known of the Mooris Idols to ignore offered foods, most often their health will decline due to slow starvation. As its beauty is most evident while swimming, giving it adequate room is well rewarded. They uses its long snout to feed on coralline algae and sponges in cracks and crevices. In the aquarium some may pick at LPS corals and certain soft coral polyps too. Small invertebrates may be threatened as well. For all but the most expert hobbyist, it is better admired in the ocean or in a public aquarium rather than in a home tank.